In case you missed it, AMC has released the post-credits scene from The Walking Dead midseason finale! You can watch The Walking Dead post-credits scene in the player below. 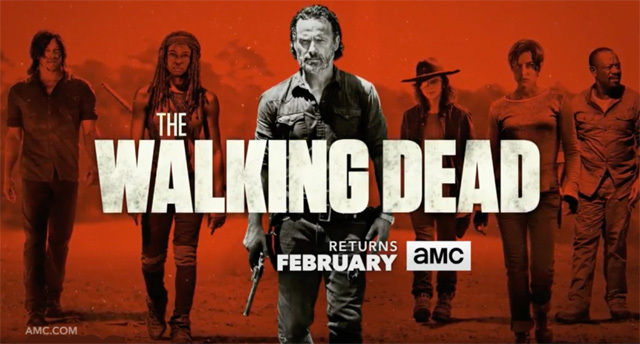 The Walking Dead will return on Sunday, February 12 at 9:00 p.m. ET/PT. The second half of Season 7 will consist of eight episodes. The Walking Dead, which remains the number one show on television for a fifth consecutive season, is executive produced by showrunner Scott M. Gimple, Robert Kirkman, Gale Anne Hurd, Greg Nicotero, Dave Alpert and Tom Luse. The first half of Season 7 saw the group fractured, broken, bereaved, and picking up the pieces while living under the thumb of oppression. Negan has successfully brought the survivors under his control, brutally convincing them to live under his rules with a deadly and horrific example of what happens if they don’t. The Walking Dead stars Andrew Lincoln (Rick Grimes), Norman Reedus (Daryl Dixon), Lauren Cohan (Maggie), Chandler Riggs (Carl), Danai Gurira (Michonne), Melissa McBride (Carol), Lennie James (Morgan), Sonequa Martin-Green (Sasha), Alanna Masterson (Tara), Josh McDermitt (Eugene), Christian Serratos (Rosita), Seth Gilliam (Gabriel), Ross Marquand (Aaron), Austin Nichols (Spencer), Austin Amelio (Dwight), Tom Payne (Jesus), Xander Berkeley (Gregory), Khary Payton (Ezekiel), and Jeffrey Dean Morgan (Negan). If you missed previous episodes of The Walking Dead (or if you just need a refresher), be sure to check out our recaps.